When Nature's Tears EyeMist was introduced in 2004, a promise was made. 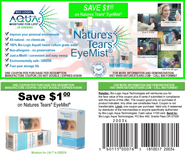 Bio-Logic Aqua Research, the company behind the all-natural water mist treatment for dry eyes, assured thousands of doctors, patients and the public that they would, "continue to conduct eye research to discover new applications and benefits of Nature's Tears EyeMist for dry eye." Since the product's introduction in 2004, the all-natural water mist for dry eye has offered a new paradigm for the treatment of dry eye disease. Dry eye symptoms are the number one reason for eye doctor visits in the United States and dry eye can be debilitating and sight-threatening. Recently, Bio-Logic Aqua Research Founder Sharon Kleyne announced that the company's ongoing dry eye research has produced a new application method for patients with severe chronic dry eye or who find themselves in a high risk environment for severe eye irritation. The newly discovered application method supplements the original directions of application. Dry eye researchers at Bio-Logic Aqua Research have discovered that there is an increased benefit to gently pulling down the lower eyelid with your finger when applying Nature's Tears EyeMist, spraying the mist from six to eight inches away for two seconds, and repeating this on the other eye (Do not put your finger in your eye). This new application method: (1) Increases the number of mist micro-droplets reaching the tear film. (2) Increases the amount of mist reaching the lower portion of the eye, slowing tear drainage and retaining the mist in the corneal area longer. (3) Increases the amount of moisture reaching the upper and lower eyelids, which also benefits dry eye symptoms. Dry eye is caused by insufficient water in the complex tear film that covers and protects the cornea and enables vision. Nature's Tears EyeMist supplements the all-natural tear film water. The application humidifies the air around the eyes, enabling the tear film to naturally absorb the mist. The mist consists entirely of Bio-Logic Aqua tissue culture grade water, which is 100% all-natural and pH balanced for biocompatibility. Nature's Tears EyeMist is the only all-natural, hand-held, non-formulated, preservative free, 100% water dry eye product that does not involve eye drops, eye droppers or head tilting. There is no blurred vision, disorientation or tear film flooding and the mist does not "run" cosmetics. Nature's Tears EyeMist contains no artificial formulations so the product may be safely applied as often and safely as desired. Nature's Tears EyeMist - Just a Mist - is available in selected drug stores and natural product stores across the United States and online at www.Nature'sTears.com and elsewhere.